Celebrating the life of Heyward Fludd, Jr.
Be the first to share your favorite memory, photo or story of Heyward . This memorial page is dedicated for family, friends and future generations to celebrate the life of their loved one. 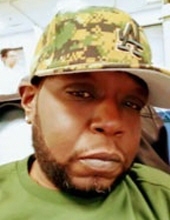 Obituary for Heyward Fludd, Jr.
Heyward Fludd, Jr. was born on August 28, 1973 in Newark, New Jersey, son of Heyward Bouldrick, Sr. and Louise Fludd. He was a lifelong resident of Newark. As a youth, Heyward was affectionately called “Fatman Big Worm” and loved to spend time in his neighborhood where he grew up in “West End Hoodaville” that is what he called it. Heyward met his fiancée, Darnese Claybon in 2000 and they shared 18 years of love together. He loved his family and friends and always gave advice. He would always say, “Please take care of yourself,” “Good morning” and “I love you all” to his family and friends. Aside from his family, Heyward was the “Fly Guy” who was always dressing sharp with his matching “fitty” shirt and sneakers he loved to wear. He was also a die-hard Philadelphia Eagles fan. On Monday, August 20, 2018, Heyward Fludd, Jr. passed away at Beth Israel Hospital in Newark at the tender age of forty-four. He leaves to cherish beautiful memories, his mother, Louise Fludd; stepfather, Roosevelt Thomas; fiancée, Darnese Claybon; sister: Monica Fludd-Williams; sister-in-law, Yvette Green and Jacqueline Williams; brothers-in-law, Derrick Williams and Mark Green; two half-sisters: Sabrina Elam and Cherise Blount; half brothers, Terrance of Connecticut, Keith Lewis, Jamie Jackson and Stan Gibbson; 6 stepchildren: Makyah Khalil, Mya, Jamar, Kariom Claybon and Jasmine Baldwin; two nieces: Fajr and Fatiha Williams; one uncle, Tommy Lee Bouldrick of Connecticut; and a host of family and friends. To send flowers or a remembrance gift to the family of Heyward Fludd, Jr., please visit our Tribute Store. "Email Address" would like to share the life celebration of Heyward Fludd, Jr.. Click on the "link" to go to share a favorite memory or leave a condolence message for the family.